Can these jaws close suture a wound? Jungle raiders - Army ants, Eciton sp. With Maryland gripped in winter's chill, Bug of the Week stowed away with some adventurous students on a remarkable adventure to the tropical rainforest of Belize. In a previous episode we met leafcutter ants, fungus farmers of the rainforest. This week we meet rapacious predators of the jungle realm. While hiking a trail in the Mayan mountains, we encountered a column of furious army ants crossing a road. 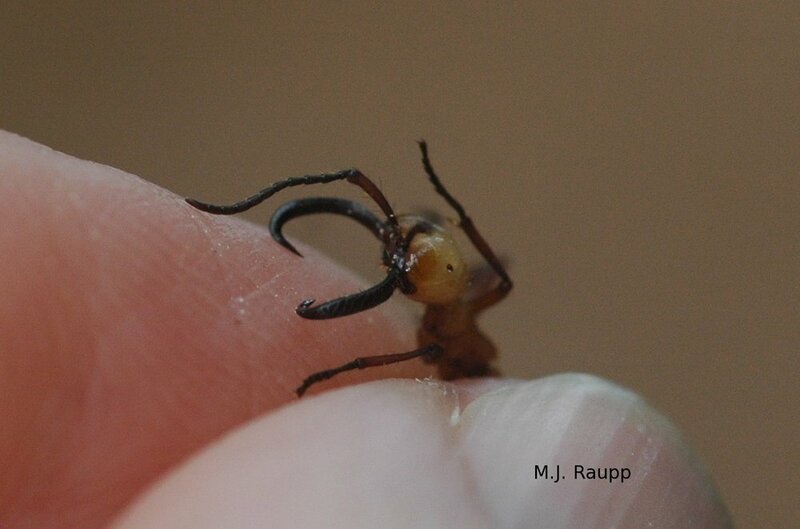 Army ants are among the most prominent and important of all species found in tropical ecosystems. Single colonies of army ants contain hundreds of thousands to more than a million workers capable of capturing and eating thousands of assorted arthropods each day. The column we met consisted of scads of large and small workers busily transporting food to a temporary food cache or colony site called a bivouac. In lesser numbers within the column were imposing soldiers. These grotesque giants sported huge, sickle-shaped jaws used to defend workers and colony from attack. The jaws of the soldiers are so large and highly modified for grappling and pinching that they are of little use for eating. In a reenactment of a scene in Mel Gibson’s “Apocalypto”, I tested the ability of a soldier’s jaws to act as a wound suture. They worked just fine. At the raiding end of the ant column, a chaotic melee of murder and mayhem ensues as swarms of stinging and biting workers capture insects, spiders, and other unfortunate small animals that fail to escape the approaching horde. After subduing victims, workers dismember their prey and transport them in large and small pieces back to a food cache or bivouac to feed developing larval ants, their attendants, and the hungry queen. The bivouac is usually in a protected location beneath a log or between the buttress roots of a large fig tree. It is formed by thousands of ants linked leg to leg in a protective living cover for the queen and the young. However, army ants may set up bivouacs in man-made structures such as outdoor privies. This can provide an unexpected surprise during a nocturnal trip to the outhouse. A night time trip to the outhouse can be especially exciting when army ants set up a bivouac inside. During the nomadic phase of the colony, workers stop carrying food toward the bivouac as night approaches. They become highly excited and begin transporting food and ant larvae away from the bivouac along one of the outward leading trails. As the old bivouac disintegrates, the queen and her entourage follow a chemical trail through the forest and establish a new bivouac at a different location. The regular relocation of the bivouac in this nomadic phase enables legions of workers to pillage untapped areas of the forest for food each day. Several times a year, the colony enters a stationary phase. During this phase, the colony hunkers down in one location for several weeks. Larvae begin to pupate and the queen lays as many as 30,000 eggs each day. During the stationary phase raids continue. In a fascinating study, Nigel Franks discovered that during the stationary phase, army ants changed direction of successive foraging bouts. The direction of each new foray differed from the previous one by approximately 123 degrees in a clockwise direction. By searching different quadrants of the habitat sequentially, ants avoid hunting in the same area twice. Foraging in different areas may also allow new victims to repopulate recently searched areas. Over the span of a few weeks, thousands of eggs hatch and hungry young larvae place enormous demands for food on the colony. By now, ants produced during the previous stationary phase have completed development and matured into new workers. With thousands of new workers to forage and the demand for food high, the colony resumes its nomadic phase and it’s time for many small insects and other prey to escape or die. We thank the hearty crew of BSCI 279M: Tropical Biology in Belize for providing the inspiration for this Bug of the Week. The wonderful book "The Insect Societies" by Edward O. Wilson and the interesting article "Army Ants: A Collective Intelligence," by Nigel Franks were used as references for this Bug of the Week. For more information on army ants, please visit the following web sites.